Alternating stripes of Swarovski's brilliant crystals and slender slices of sea pearls drop like a sweet whisper from a smooth round chain. 20" Neckpiece with 2" extension Nickel, lead and cadmium free. 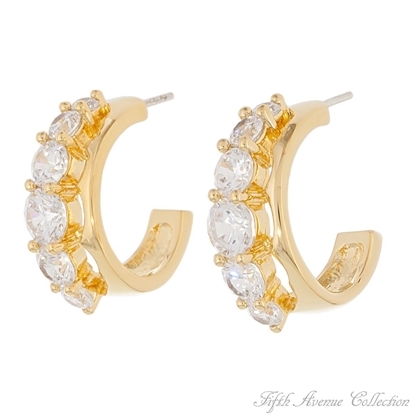 Discover the simplicity of dressing chic for every occasion when you wear these bold and beautiful half-hoop earrings studded with AAA quality cubic zirconia. Earrings with sterling silver posts Nickel, lead and cadmium free. 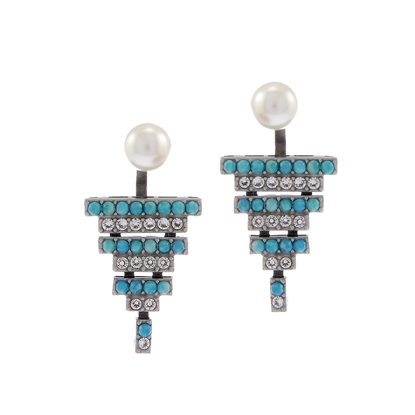 Supple triangles adorned with alternating rows of exquisite turquoise beads and blazing Swarovski crystal drop from delicate white pearls. This unique jewellery will not only dazzle but intrigue with sharp, fanciful style. Timeless appeal abounds within the modern Y shape of this enchanting neckpiece. Suspended from a delicate curb link chain, a circle of polished rhodium with attached bars of embellished brilliants descends into a radiant cubic zirconia pendant. A perfect marriage of contemporary lines with ageless sentiment, this piece will have a home among your jewellery collection for all of time. 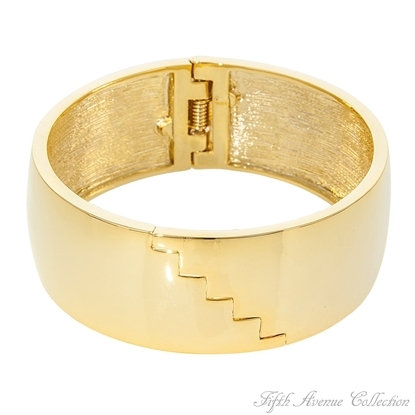 The silky smooth finish on this inch and a half cuff bracelet renders a "High Impact" with its casual glamour, style, unique scissor-cut opening, and easy to wear spring hinge. 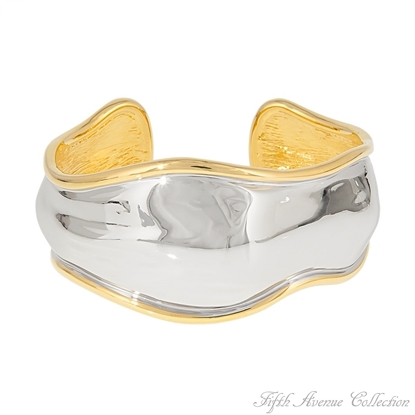 Slip it on and get ready to glow places!7.5" cuff bracelet.Available finished in your choice of gleaming gold or silvery rhodium.Nickel and lead free. 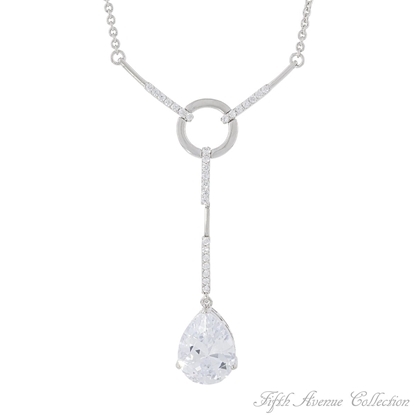 Brighten any day with Fifth Avenue Collection's stunning "Love And Light" pendant. 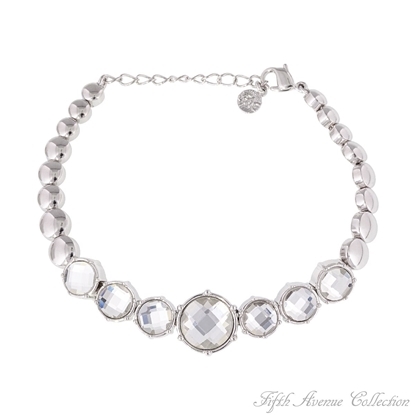 Ten blazing marquise cut Swarovski crystal surround a stylish 1" centerpiece with a rhodium satin pebble finish. Featuring a 28" rose gold rolo chain. Lead and nickel free. 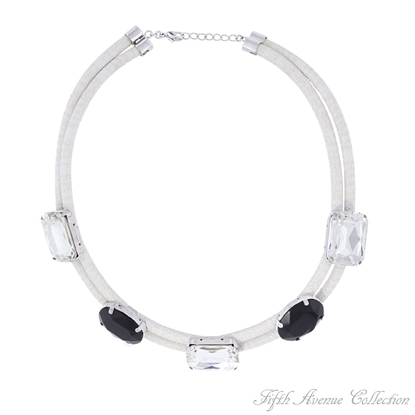 Bring the airy romance of a summer’s evening to your style with Fifth Avenue Collection’s “Midsummer Night” neckpiece. Textured double strands of breezy white leather create the perfect accent for luminous, clear and jet German glass. 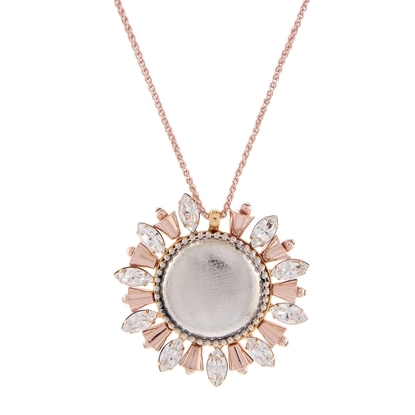 With complimentary shapes and beautiful contrasting colour, this piece is dreamy, romantic fashion at its best. 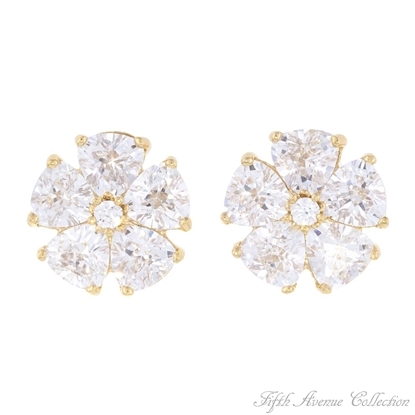 Fresh style blossoms within this high-class pair of earrings. Luminous petals of artfully faceted cubic zirconia stem from Sterling Silver posts and nestle within a bed of finished gold. Bold and uniquely beautiful, this pair offers a refreshing spin on chic glamour. 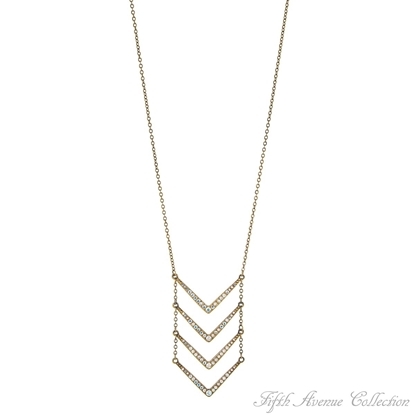 Gold Plating, Clear Cubic Zirconia, Sterling Silver Posts Measurements: 3/4"
A design that is eye-catchingly beautiful and big on detail, our “Special Night” neckpiece is sure to make you feel fabulous! 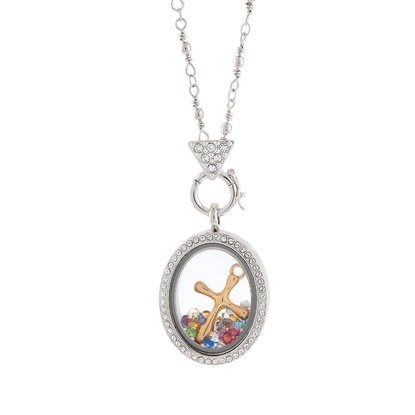 Featuring a golden cross and shimmering multi-colored crystals encased in a stunning oval encrusted with clear Swarovski crystal. 28" designer chain finished in rich rhodium. Nickel and lead free. Your wish will come true with these heavenly earrings. Luminous, clear cubic zirconia drops in a vertical row of three, breaking off into a twinkling trail of marquise and pear shaped stones, creating a sparkling sensation that when worn, is sure to have an impact. 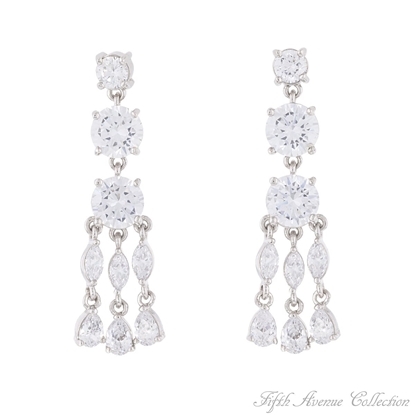 Set within a gleaming rhodium finish upon sterling silver posts, these earrings guarantee to brighten your nights. Rhodium Plating, Clear Cubic Zirconia, Sterling Silver posts Measurements: 1 3/4" x 1/2"
A delicate open loop chain sprinkled with tiny flowers that sparkle as they “Tenderly” touch the wearer.16” Neckpiece with 2” extensionNickel and lead free. 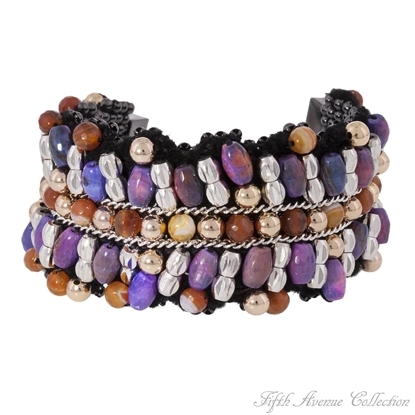 This gorgeous bracelet is the perfect pairing of classic style and modern elegance to bring cool sophistication to your look. 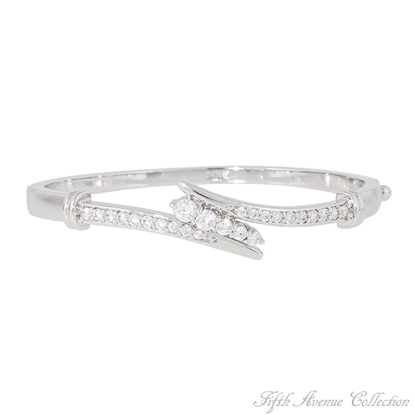 A polished rhodium band with embellished design leads into the breezy, high fashion bypass style, complete with glimmering Swarovski crystals. A tongue and groove hinged clasp makes this style easy to snap on and off for effortless ease in style.